Sunlight Supply-Titan Titan Controls Helios 13 - 240V, 16 HID Light Controller with Timer (702828) SEEDS ETC. The Helios 13 - 16 light controller with timer provides up to 16,000 watts of lighting control. This 'Professional Series' commercial lighting controller is built using industrial grade Allen Bradley components, one of the most respected names in the industry! And it's built right here in the USA! 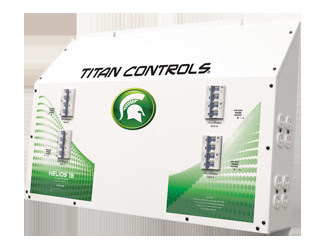 Titan Controls continues to bring you the top quality controllers that you've come to expect. Gardening with the gods, what could be better! The only lighting controllers featuring industrial-grade Allen Bradley ballast rated relays. Premium quality timer with battery back-up - Keeps lighting schedule in the event of power failure. Sequenced lighting delays (0 - 30 seconds) for each light bank.